Well, the worst winter Indy has seen in thirty years doesn’t seem to be slowing down. This week was the third time I was inadvertently held hostage in my own home by the snow. One would think that might not be such a bad thing, and yet, when it comes down to it, for as productive as I could be, I am lost without an idea or a plan. So, for my fellow snow hostages out there, here some of my favorite ideas for making the most of previously un-planned down time. This is the place in my home which is always neglected. I take things out for my project and then stuff them back in. Taking the time to craft the craft space, well, it hasn’t happened. But I aspire to that. I wish for my wrapping station to be organized, for my many impulse ribbon purchases to be kept in a way that is both functional and beautiful. Above are a few of my favorite ideas from Pinterest. 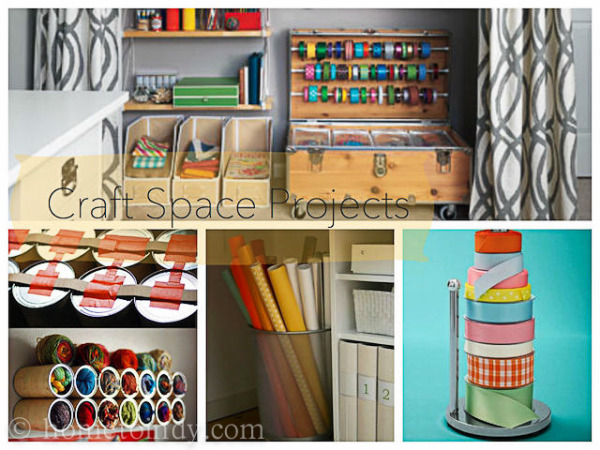 My favorite was taking old soup cans, wrapping them in craft paper and making them into yarn-storage. Because let me just say, of all the wild things in my craft space, yarn is the most unruly of them all. Turning a shoe caddy into a cleaning product holster. Genius! Making your own laundry detergent. This basic guideline doesn’t mention that you can add your own essential oils to make your laundry whatever fragrance makes you want to crush your face into a towel and breathe. Take that, bubble bath! Organizing bed linens into single packets, stored in a pillow case. I have dogs. And company. This means I have multiple sets of linens and I’m always rotating them. This storage method is fantastic. This little set of laundry room art got my wheels turning. A bigger project, but one I love. I’m forever tripping over baskets. 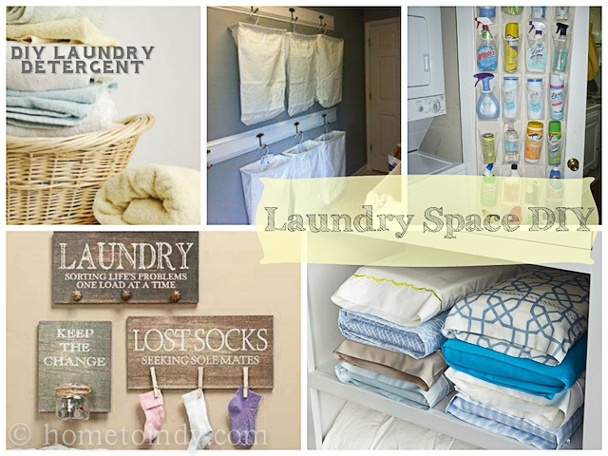 With this project, you could sort clothes into these hanging laundry bags, which each contain one load worth of laundry, then dump, and go! No tripping, no fuss, no muss. Surely a beloved room of the house, whether in practice or in theory. A good, warm place to give your attention, from deep in the belly of winter. Here are some good kitchen projects, cooking and baking excluded because that’s way too long a list. 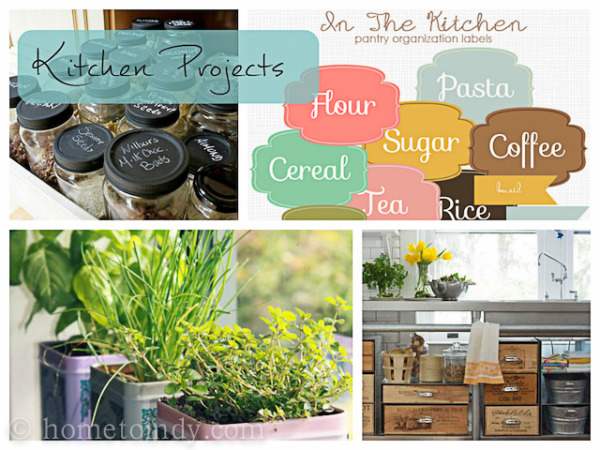 Kitchen Labels - Free, printable and ready for you to label things in your pantry. For several months I saved spaghetti sauce jars, jelly jars...pretty much anything that came in glass and then began reusing them as kitchen storage. Now, with these labels I can identify your purpose for each jar! Practical, organized and ...well, cute. Along the lines of the labels, I love the idea of painting spice lids with chalkboard paint. Even though they’ve used it for labeling, I’d use it for dating my spices, because believe it or not, they do expire at some point. However, if you happen to keep your spices in one of those pull-out drawers which is low, being able to write the names on the top would be excellent. A winter herb garden What could be better, when you are snowed in, longing for Spring than bringing the fresh, aromatic joy of herbs to your window sill? And I love this idea of using old tea tins. Good stuff. Finally, that last picture, with the yellow tulips, well...I guess that’s just something to aspire to. I was just so pretty, I had to include it. 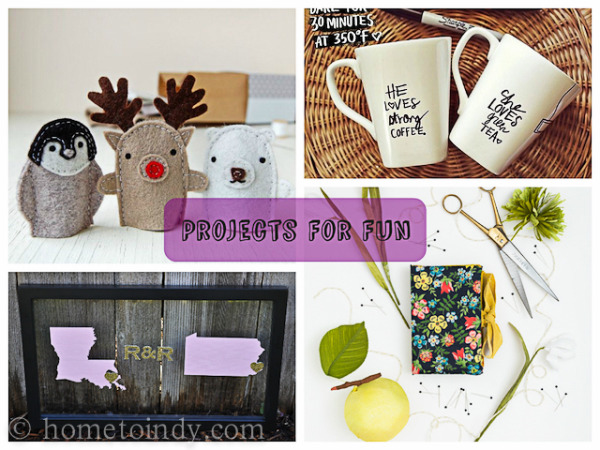 If your will for household projects has expired, or you’ve already Martha Stewart-ed them all, here are a few ‘for fun’ craft projects. For the kids, here is a pattern for Finger Puppets and as a bonus, here is the most adorable idea for a finger puppet stage. Have loved ones in other places? Has your personal story had many landmarks? Have a frame or two you aren’t using? Here’s a really fun project for your walls! If you’re handy with a sewing machine and have some extra fabric, make your own phone accessory. I will swallow my envy of your ability. Transform some plain mugs with a sharpie and an oven. Write and then bake at 350, for 30 minutes. You might be able to tell, I’ve spent some time on Pinterest, getting prepared so I won’t be caught without hibernation to-do’s when the next snowfall comes!